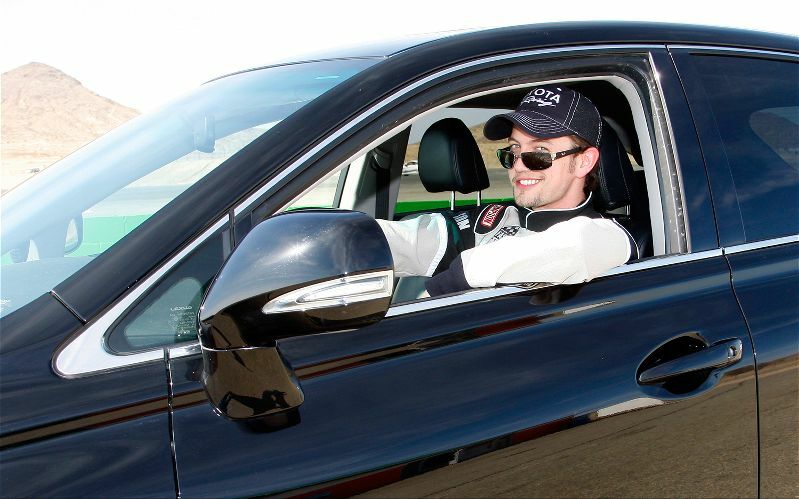 "Twilight" will fans see a very competitive side of Jackson Rathbone tomorrow during the Toyota Grand Prix of Long Beach celebrity race, where he'll drive a race-prepped Scion FR-S. The actor, who is best known as Jasper Hale in the vampire saga, has a more relaxed attitude when it comes to dealing with Los Angeles traffic in his 2012 Lexus RX450h. "When L.A. gets too congested in traffic, sometimes I'll pull over to a side street and take a nap in my car, waiting for the traffic to die down. I sleep very comfortably because the seats are so soft and cushiony," he says, giving the daily driver a 9 out of 10 rating. "It would have been a 10, but it doesn't have an espresso machine, so 9." Rathbone loves his hybrid SUV, calling it "super comfy, economic, and roomy." Rathbone learned to drive in a hand-me-down SUV from his mom, and he says it's still his favorite car. "My birthday's a week after hers, so she got a new car and I got her old '96 Suburban for my 16th birthday," he says. "When I was 16, I was DJ-ing all over west Texas, so the Suburban was perfect for hauling all of my gear and still had room for four passengers. I remember a time where I was everyone's ride to some dance and I had about 12 girls in the back of the Suburban, while my buddy Jon and I were riding high in the front. It was good times." The first car Rathbone bought was a Scion xB, although he hadn't planned on buying anything. He was content with his second hand-me-down car, his sister's Nissan Maxima. "I can't quite remember the year, but I bought it after my second car, a Nissan Maxima, was totaled on the 405 freeway heading up to Idyllwild from L.A.," he says. "I was driving along at a good 65 mph when suddenly the traffic came to a screeching halt, as L.A. traffic tends to do, and I had to use my e-brake to make the stop in time." But the car behind him didn't stop. "He crashed into my car from behind at 45 mph, totaling my poor Maxima. But on the bright side, I'd been wanting to buy the new Scion xB, so I did! I bought a used xB." He was able to buy it with the insurance money as well as some savings from appearing in commercials. "My favorite road trip might be the worst road trip I've ever had," Rathbone recalls. "Christmas 2011 my girlfriend and I decided to road trip it to Texas." He had driven from Los Angeles to Texas many times and was excited to bring her along on the ride. "I love imagining how the first settlers of the West must have discovered the seemingly endless desert," he continues. "The hardships of traveling across that rough terrain, plowing the first paths through the open tundra. It seemed romantic." At the time he had a 2003 Suburban, and about five hours into the 18-hour road trip, the car broke down just past the Arizona border. "Luckily, we were able to coast into town, but unluckily it was two days before Christmas and the entire small town of Yuma, Arizona, seemed to have closed down," he says. "The third tow truck yard we called was able to pull us into the only open auto repair shop, Pep Boys, but they were closing as I ran up to the doors." He explained what happened to the car and the last available mechanic took a quick look at the Suburban and shook his head. He said they needed a welder but that he was off until December 28. "We were screwed," he says. "I asked if we could park our car in the Pep Boys parking lot until we got back from Texas, having found a rental car company, thankfully, within walking distance. They agreed. We walked a little over a mile to the Yuma, Airport, where the Alamo rental car company was, but they were out of cars!" As it turned out, so were Budget and Hertz. Finally, Avis said it would rent Rathbone their last car. "We drove back to the parking lot, grabbed our luggage and Christmas gifts from my busted suburban in the Pep Boys parking lot," he says. "We drove to Tucson and stayed the night at a Best Western. The following morning was Christmas Eve. We took off around 8 a.m., only to get stopped five hours later near the New Mexico border." The freeway was closed because of a blizzard, leaving the only highway to Texas undriveable. So they turned around and called every airline to find a flight out of Tucson or Phoenix. "We found one last flight leaving for Phoenix in six hours, so we booked it and sped back west to make our flight headed east," he says. "We got there three hours before the flight and decided we had to get another suitcase to fit all of our gifts. We stopped by Target and bought the biggest and cheapest floral print suitcase we could find. We got out to the Target parking lot and ripped open all of our carefully wrapped Christmas gifts in order to fit all of them in our new suitcase." Strangers gave them curious glances at the Target parking lot. "Two adults ripping open Christmas gifts the day before Christmas, in a parking lot," he describes. "Finally, we made it to the airport. We flew into Texas and made it back home to Midland at midnight, just in time for Christmas." The way back was also equally difficult, Rathbone says, including finding out the Suburban was towed from Pep Boys a day after Christmas. After the only available welder in Yuma fixed it, it broke down again, this time a little over an hour from Los Angeles. "It turns out it was a chop shop," Rathbone says, adding they ended up "riding in the Suburban on top of the tow truck speeding down the I-10 west, having the tow truck driver drop us off at Morongo Resort and Casino, where we had dinner and waited for some amazing friends to come pick us up. That was hands-down my favorite road trip. What an experience." With up to 200,000 spectators expected at the Toyota Grand Prix of Long Beach, it's the largest annual event held in that city. After the tragic Boston Marathon explosions, security will be tightened at this year's race. Rathbone hopes to do well in the Pro/Celebrity race. Like all the celebrity racers, Rathbone got practice time in at Willow Springs Raceway and on the actual street course in Long Beach. "I began training in Willow Springs thinking that it was all about speed, but it's not. It's about consistency. 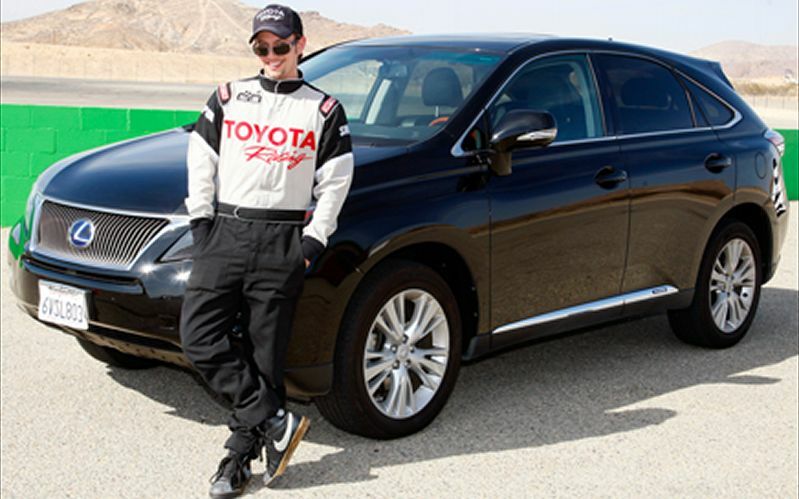 The cars we're driving are all about momentum," he says. "The time I spent at Willow Springs taught me the limits of the cars," Rathbone continues. "The day at Long Beach proved to me that those limits can be pushed. My goal is to stay, hopefully, at the front five, to never glance backwards and always keep a forward perspective. Before any of the training, I thought this would be easy. Now, I understand a little more about the physical and extreme mental control necessary to compete in a sport like this. Much respect to the pros, man!"